Ellen DeGeneres has joined a Disney-backed campaign to protect Australia’s Great Barrier Reef. The US talk show host recorded a video for the ‘Remember the Reef’ project on Wednesday, which coincides with the release of new film Finding Dory. IN the animated sequel to 2003’s Finding Nemo, Ellen voices a forgetful blue tang fish who tries to find her family in California. The first film was set in the Great Barrier Reef and producers Disney have confimed Remember the Reef will highlight environmental threats to the area. (Ellen) states in the video:”Hi Australia, it’s me, Ellen DeGeneres.” (See the full video at the Remember the Reef link, here. “As you may know, I’m a big fan of your beautiful, great, wonderful Great Barrier Reef, which is home to my favourite fish, Dory. “And as you may remember, but Dory probably doesn’t, she is a blue tang and has many other amazing species that live in the reef with her. “It’s critical that we protect this amazing place and we’d like your help,’ she concluded. To achieve this, they are working alongside not-for-profit organisation Greenfleet to restore ecosystems along the Queensland coast. 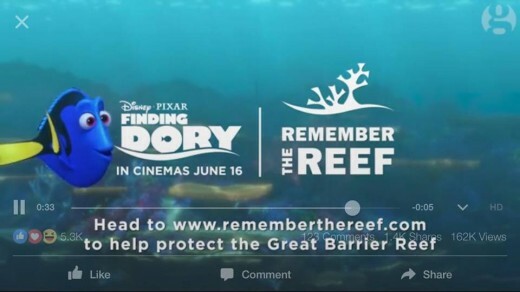 Other supporting partners for Remember the Reef include Qantas, SEA LIFE Aquariums, and Airbnb. Meanwhile, box office analyst Shawn Robbins told Variety this week that Finding Dory may replace Toy Story 3 as the highest grossing Pixar movie of all time.